We humans like a bit of adventure, as a rule. We drive fast, we hang glide, we even eat bacon with breakfast. But for the most adventurous among us, nothing is better than living in a dangerously precarious house. These houses are perched high on cliffs and mountains, giving their residents thrilling and, we would imagine, somewhat frightening views. 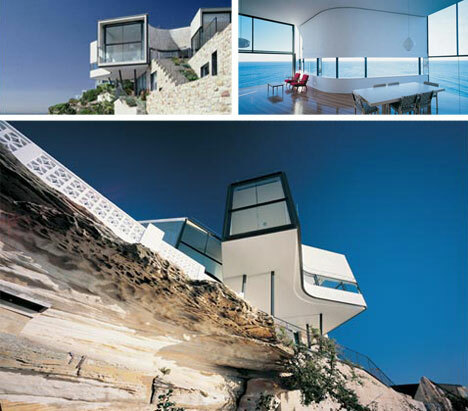 This is part of our collection of 70 Amazing Houses from Around the World. 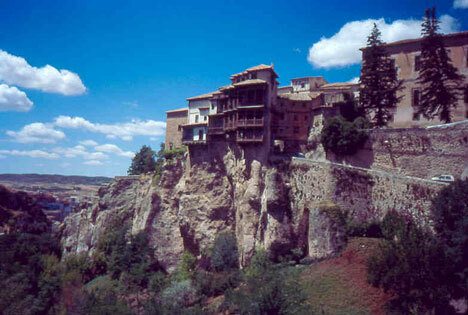 Among the most famous of all cliff houses are the hanging houses of Cuenca in Spain. This ancient village found itself with a need to expand in the 18th Century. Instead of building out, they built up. The resulting buildings look like they will topple down into the ravine any day, but they are apparently quite stable. 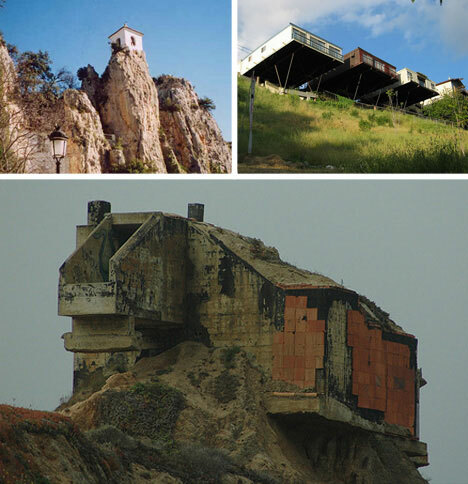 These clifftop homes are now a tourist attraction for the town. When the owners of this piece of cliffside real estate wanted to build a home here, the architects nearly wouldn’t take it on. The stunning finished product features panoramic views of the sea enhanced by the unique geometric architecture. Located in Australia, the view from this living space is not for the faint of heart. The owners have remarked that during a storm, it seems that the waves will simply wash the structure away. 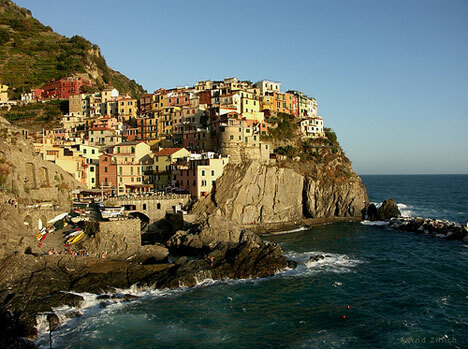 Italy is full of picturesque seaside villages, but Manarola, Cinque Terre is certainly one of the most precariously placed. It’s hard to say just how old this village is, but ancient Roman texts have been found which celebrated the wines produced there. Today, you can still enjoy strolls through the vineyards or a walk on the Via dell’Amore (Path of Love). 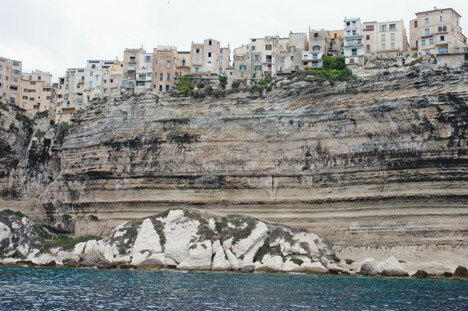 Along the limestone cliffs of Bonifacio in Corsica are a number of precariously perched buildings that look to be at risk of collapse any day. But the buildings hold strong against the constant battering of the Mediterranean Sea, and Bonifacio is a popular tourist attraction. Although huge numbers of tourists flock to the island city every year, Bonifacio has somehow maintained its charm and its decidedly French atmosphere. If you are hardy and adventurous enough to trek high into the Himalayas, you will eventually spot one of the most breathtaking monasteries in the world. 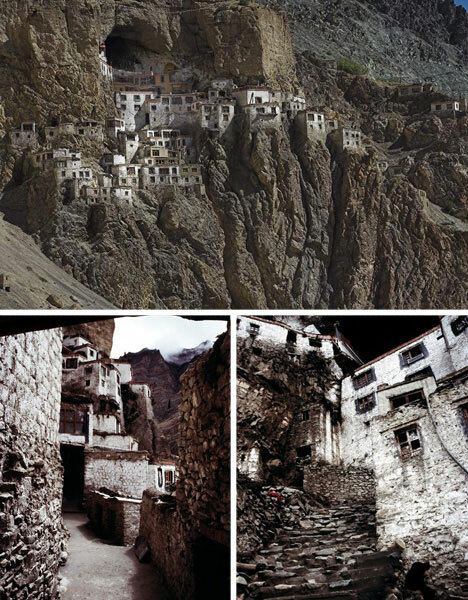 Phuktal Monastery, home to the Gelug (or Yellow Hat) Buddhist monks, is only reachable by foot. It is built into the side of a cliff at the mouth of a cave and contains a natural spring. It is amazing that this structure has existed as long as it has, being constructed of mud bricks, stones, and sticks. 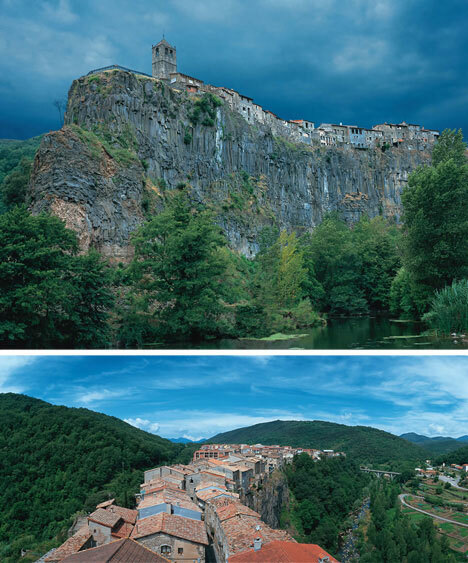 The tiny town of Castellfollit de la Roca takes up less than one square kilometer in Catalonia. The houses and other buildings are built right up to the edge of the cliff on which the town is situated. The basalt cliff was formed from ancient lava flows and is over 50 meters high and nearly a kilometer long. The spectacular vista is a favorite of photographers and painters everywhere. 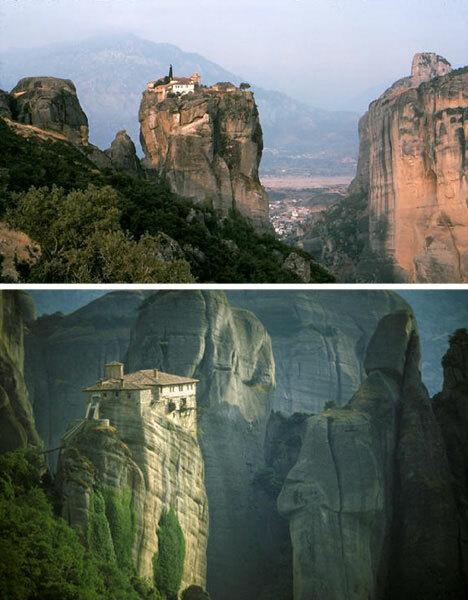 It would be impossible to gather a collection of precarious dwellings without a mention of the Meteora monasteries in Greece. Meteora translates literally to “hovering in the air.” They were built hundreds of years ago by monks who initially lived in caves in the area. During the times of Turkish invasions and occupation, the monks climbed higher and higher, finally building their monasteries atop the tall rocks. Although they were once accessible only by climbing the rock faces, the monasteries can now be reached by roads and steps.